Our sales and service network spreads in 30 provinces and other countries. We supply all parts of CG, GN, CM motorbikes,100cc & 110cc, 125cc and 150cc scooters, 125cc, 150cc, 200cc and 250cc, engines:pistons, cylinder, seat, fuel tank, frame body, carburetor, clutch, handle bar, ect. We are always improving our design and patterns to confirm to the word market. Customer satisfaction is ours marketing purposes.Sincerely welcome customers and friends throughout the world to our company. Unity, Struggle, Innovation, Seriousness. The quality of ours is as good as that of many other suppliers, while our prices are not high as theirs. By the way which items are you interested in? Let just inquiry us. And we also welcome customers throughout the world to our company. We strive to provide you with high quality products and best service. Looking for ideal Main Cables Gas Scooters Manufacturer & supplier ? We have a wide selection at great prices to help you get creative. 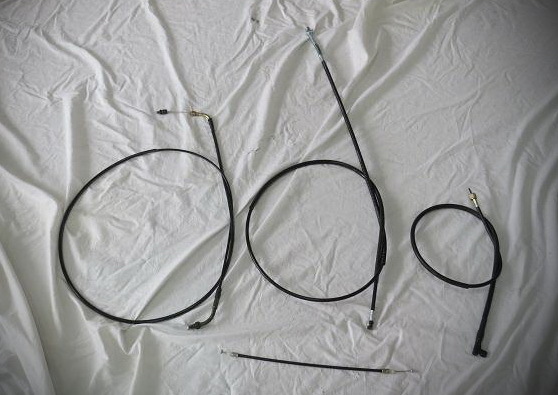 All the Gas Scooter Parts Main Cables are quality guaranteed. We are China Origin Factory of Scooter 125cc Vespa. If you have any question, please feel free to contact us.